I haven't posted in forever, and found this in my draft folder! So here 'tis and more coming, I promise! :D I'm doing a post a day in December as a record of our advent calendar adventures, and will post a bit next week while Lolly and I are on holiday! 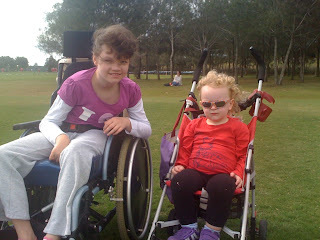 Here are some more snapshots of our lives with the wheelchair. Lolly says "it's my chair!" Snail is funded by the government for trips to and from our place to her special school, so we get a special taxi which is like her school bus. She shares her trip with four or five other kids, including another boy in a chair (the cab takes two chairs). Here she is getting loaded up! The bus comes round 8am and gets her home just after 3pm. I can't tell you how wonderful it is to have this transport to and from school, it was a sanity saver when Lolly was first born! It also saves us a lot of lifting and carrying. Snail does have some independent mobility when not in the chair, she has a super huge walking frame that we keep at school, and at home she gets around by bum-sliding. Here she is on the floor having a dance! Interestingly, Lolly never crawled, she only got around by bumsliding, too! I think she learned it from her sister! Here they are when Lolly is little, bum-shuffling up the corridor to get into mischief! 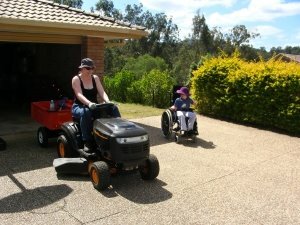 One thing about a wheelchair, is that it needs a good clean! Here is the underneath the seat part after we'd taken it apart for a clean. Complicated!